Stay in Skiathos's best hotels! Centrally located, Hotel Kastro is 820 feet from Skiathos Port and a few steps away from taverns and mini markets. It is surrounded by a garden and offers air-conditioned rooms. We had the economy room, cause it was the only one left at the time of booking but we found it very good, extremely clean, staff very kind and helpful! In an olive grove on the outskirts of Skiathos Town, 656 feet from Megali Ammos beach, Hotel Rene features a swimming pool and a snack bar. Our whole experience was really enjoyable. This is an immaculate and beautifully kept family run property with very friendly and helpful staff, lovely rooms with superb views as all rooms face the sea and the rooms have very comfortable beds. The owners really care about the hotel and your experience whilst you are with them. Nothing is too much trouble. The beds and towels are changed very frequently adding to the comfort of guests with rooms serviced daily. There a lovely pool area with very comfortable sun beds and towels available for both the pool and the beach at a very small cost. Access to the hotel is via either a steep hill or steps so may be more difficult for less ambulant guests without the use of a car or taxi. Located in the center of Skiathos town, close to the house of Papadiamantis, the family-run Mouria Hotel offers a tavern and traditional accommodations with air conditioning. I looked at 10-15 hotels and based on the reviews picked this one. The reviews were spot on!! Great location! In the center of everything, close to the airport & a short walk to the port yet not loud for sleeping. Super clean, super staff, super food! Harriet was awesome! It was like staying at a friends house :) Her place is beautiful and very authentic! She helped us plan our day - sun or rain! She knows everything about the island and what it has to offer. Look no further - this gem is a must! I will see you again Harriet when I return with my daughter! Thanks for an unforgettable stay! This family-run property is located on a hillside, just 820 feet from Agia Paraskevi Beach. Boasting a Mediterranean restaurant, Magic Hotel features a pool area with children’s pool, hot tub and bar.... The hotel is beatiful, has a Greek style unlike the standard appearance once, very well maintained, pool is nice as well as music at the pool and pool bar, breakfast is nice and View both from where breakfast is served as well as from room is great. Staff is increadbly nice and helpful by all means - from breakfast (Julian and Bruno) to front desk, pool bar and cleaning staff - all are. Centrally located in Skiathos Town, family-run Babis offers a roof terrace overlooking the Aegean Sea. The hotel provides free Wi-Fi and free shuttle service to and from the port and airport. Great sea view!Very nice and polite hosts!Clean and tidy!A comfortable place to stay! Excellently located in a peaceful area, just a 5-minute walk to the center of Skiathos, this adults-only hotel offers an Olympic-sized swimming pool and free breakfast. Beautiful place. Staff very nice and accommodating. Lovely pool area though not pool season for our visit. Would definitely stay again. Surrounded by a pine-tree forest overlooking Koukounaries Beach, the 5-star Elivi Skiathos covers an area of 213 acres and consists of 3 residential areas, including the Elivi Xenia Hotel, the Grace... The best of everything. It has the best amenities, best breakfast, best staff and most amazing views I have ever seen. In an olive grove on the outskirts of Skiathos Town, 656 feet from Megali Ammos beach, Hotel Rene features a swimming pool and a snack bar. Our whole experience was really enjoyable. Excellently located in a peaceful area, just a 5-minute walk to the center of Skiathos, this adults-only hotel offers an Olympic-sized swimming pool and free breakfast. Beautiful place. Staff very nice and accommodating. Located in Agia Paraskevi in the Skiathos Region, 30 mi from Volos, Zorbas Family House features an outdoor pool and seasonal outdoor pool. Guests can enjoy the on-site bar. Friendly family and very helpful staff, excellent breakfast and quiet place. Just off the main street of Skiathos Town, this 4-star hotel offers a lovely courtyard with pool and sun-lounger terrace. The minimalist rooms have king-size beds and flat-screen TVs. I liked everything. No complaints. 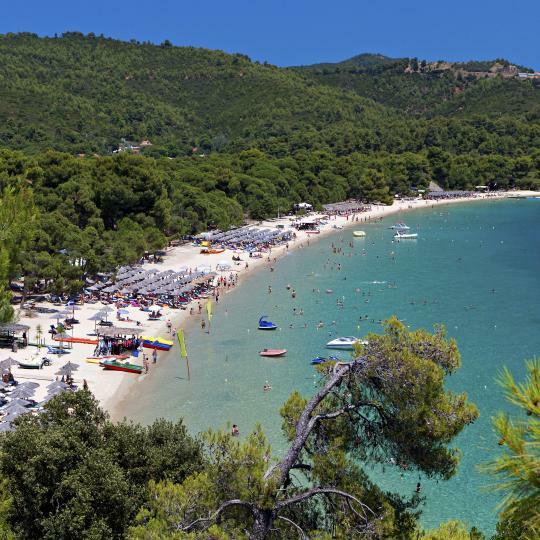 Located 98 feet from the sandy Megali Ammos Beach in Skiathos, the Tomato Beach Hotel, Philian Hotels and Resorts features free Wi-Fi throughout. Really clean hotel, tasty breakfast, happy people, beautiful scenes, comfortable accommodation. 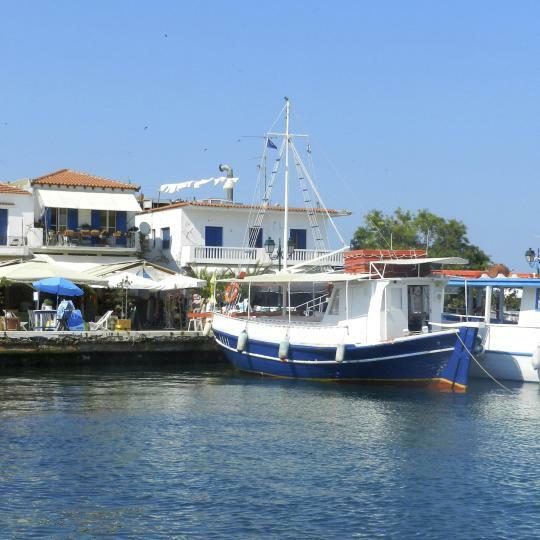 Ifigenia is next to the marina, within walking distance of the bus station providing services to the rest of Skiathos island. It offers rooms with a balcony and a swimming pool. I have to say that the whole stay was very laid back which was what we needed. Built on a hillside with views over Skiathos Town and the Aegean Sea, Entechnos Living features a swimming pool with a sun terrace. Free WiFi is available in all areas. Beautiful setting for this lovely Hotel and Katerina was a fantastic host. Enjoying direct access to the sandy beach of Vasilias, Kassandra Bay Resort features 2 seawater pools, a children's pool and a large wooden deck surrounded by blossomed gardens. Having been to Greece many times before this is easily the best hotel that we have stayed at. Boasting a privileged location above Platanias Beach in Skiathos, Atrium Hotel features an outdoor pool and a sun terrace with panoramic views over the Aegean Sea. We spent our honeymoon here and it more than met our expectations. We had our own private pool. Built on a hillside and featuring lovely scenic views, the Hotel Paradise is a family-run property that offers clean and comfortable accommodations. The hotel is lovely and picturesque, situated on one of many Skiathos hills. Centrally located in the town of Skiathos, the family-run Filoxenia Hotel is within short walking distance from taverns, bars and super markets. It offers air-conditioned rooms with a private balcony.... Friendly, great location, responsive, very pleased. Boasting spectacular views over Koukounaries Bay, Skiathos Palace Hotel offers a swimming pool with sun terrace, just 492 feet from the sandy Maratha Beach. The hotel staff are very kind, helpfull and nice. Once the home of famous writer and poet Alexandros Papadiamantis, this house-turned-museum preserves the history of his life and work. Sitting proud at the end of the Bourtzi Peninsula is this grand old fort now used as a cultural centre and summer theatre. With its staple needle-eye rock formation, unique round pebbles and pristine turquoise waters, Lalaria is the island's most famous beach. Explore an uninhabited island, visit a secluded beach only accessible by boat and discover a medieval town and tavern on a day-long boat trip. Traditional two-storey buildings border charming narrow alleys and stone stairways in this lovely Old Town located west of the modern city. 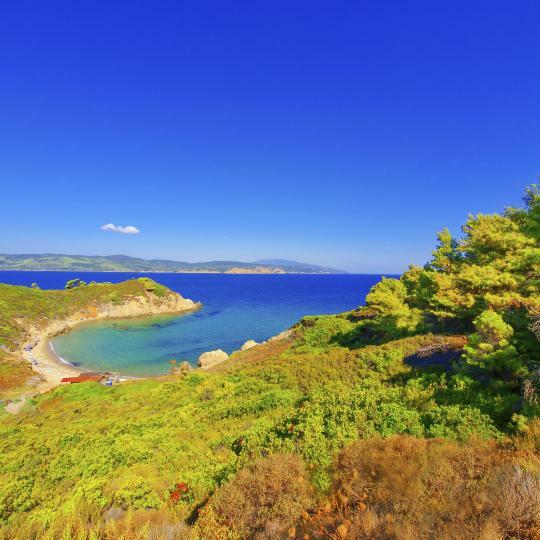 Known for its resplendent golden sand, Koukounaries borders a protected wetland area and is Skiathos’s most popular and well-equipped beach. Meander through one of 25 marked trails to reach distant beaches and remote monasteries protected by a verdant pine forest. 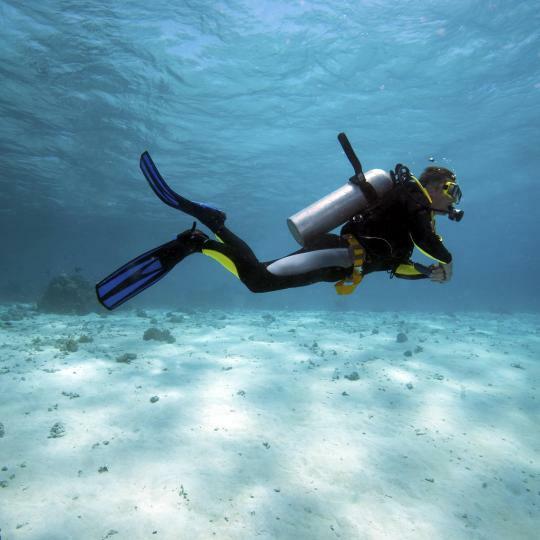 The Agean’s crystal clear waters with up to 30 metres of visibility and comfortably warm temperatures make Skiathos an ideal scuba-diving destination. 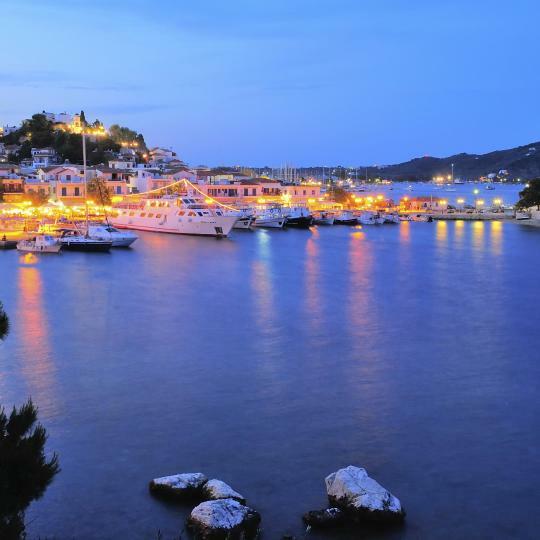 Laid-back lounges, lively cocktail bars, happening dance clubs: Skiathos Town has a variety of nightlife entertainment options for every taste. 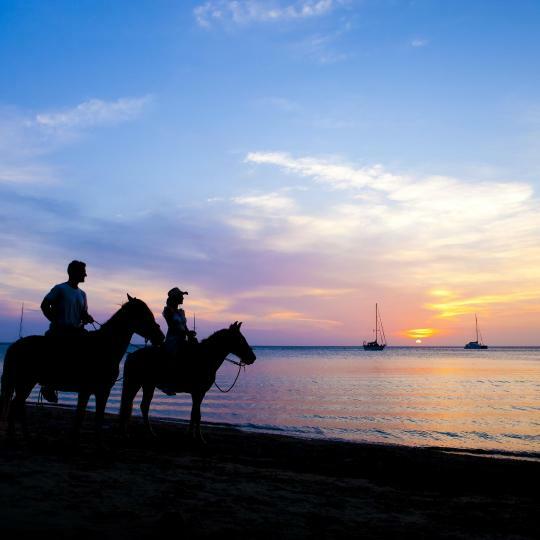 One of the island’s most traditional and popular activities, horseback riding is an excellent way to see the countryside or even the coast. Sokaki is absolutely charming in a lovely area of Skiathos, close to everything and yet extremely private with a fantastic view over the rooftops to the sea. The room is spotlessly clean and the bathroom is big. There is a fridge in the room but it would have been nice to have a kettle or a small hot plate for coffee. George is an amazing host a really warm and generous person who met us at the port even though our ferry was an hour late an took us to the airport at 5:15am. I highly recommend Sokaki and would stay there again. The one bedroom apartment we rented slept three people, was Number 10, on the first floor , it had a large balcony looking out over the garden. 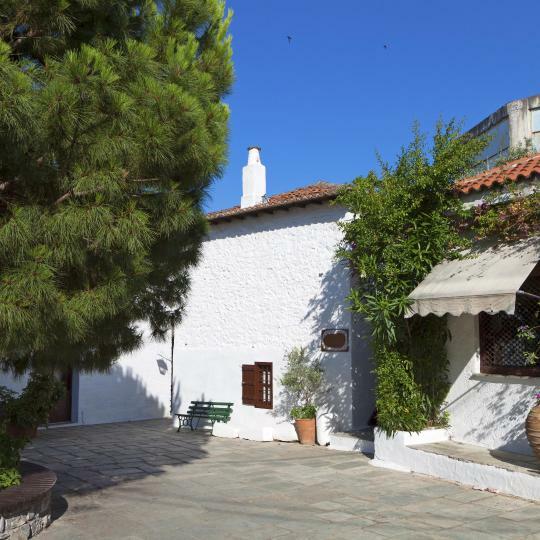 Property was lovely, in a quiet side street centrally located just off the main Street in Skiathos Town. The owner Denis was at the property when we arrived to welcome us and also there at the end of our holiday the day we left. He was always available if we needed anything, and was very hospitable and helpful. I have no hesitation in recommending Skiathos House. I have to say that the whole stay was very laid back which was what we needed. The bed was firm and comfy, and unbelievably big. We were next to the pool and the breakfast room which was very convenient. We stayed in one night and were allowed to bring in an Indian take away (which was also fantastic). All in all the stay was very pleasant. We were so close to the port and the main shopping area so it was easy to do what you wanted. 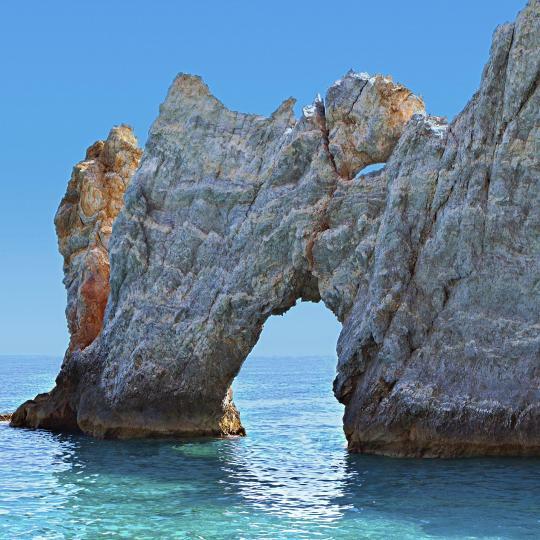 We will return at some stage, and just to add, Skiathos is a dream island. The hotel is lovely and picturesque, situated on one of many Skiathos hills. The view from the room was stunning. Everybody was nice and made our stay very pleasant. Breakfast was good but it was the same every day so I would recommend changing it a little bit from time to time (maybe include local cuisine?) Rooms were very clean. The pool looked nice but we did not have time to use it because Skiathos has so many nice beaches. We stayed at zachos hotel for 6 nights ..its a family hotel ..we loved our stay in this hotel ..george d owner was so friendly we felt like home i recomend to all travelers to stay at this hotel..7 minutes walking u can be at troulos beach ..u have tavernas and local restaurants near this hotel .. if i will visit skiathos i will defenitly will go zachos again .. thanks to zachos family for making my vacation paradise.. The hotel owner/operator Yiannis was very accommodating. He speaks Greek (as do we) and also English. He assisted us by picking us up from the airport and dropping us off at the port for our boat the following morning. When we arrived at the hotel he brought us to the roof and treated us to some wine with the perfect view of the village. This is a must stay if travelling to Skiathos. We were treated as family. Very cosy and clean room with the most outstanding view. 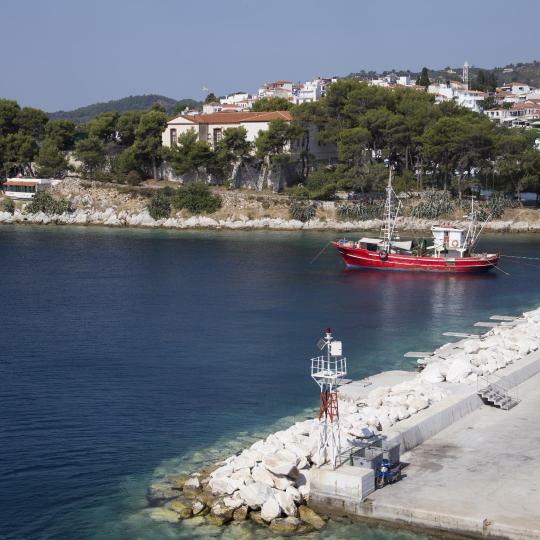 It overlooks the port of Skiathos and is 5 minutes walk from there too, which is quite extraordinary. Staff picked us up at the port and escorted us to our room. You can find within walking distance anything that you can think of - within reason. Overall, splendid experience and would return with much pleasure. Lena (host) and Maria were friendly and helpful. We arrived early and there was no problem with us gaining early access to apartment. The apartment was large by Skiathos standards and was very clean. It offers easy access to town. And it is very close to a supermarket and to a bus stop. Hosts were incredible, the house was spotless and decorated with taste. It was spacious and has great views over the city and sea. It is literally in the heart of skiathos town but hidden enough from the noise. Friendly, great location, responsive, very pleased. 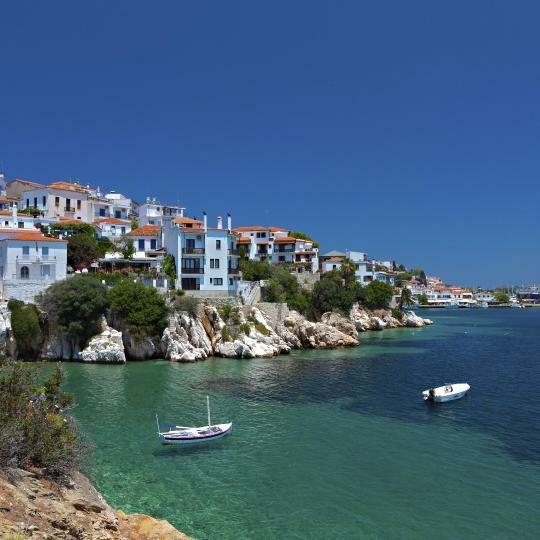 On a quiet, small street, a big advantage in the busy town of Skiathos. Will stay there again if I'm in the area. Clean. Good location to Skiathos town. Easy and quick to get to from airport. Breakfast was good with good selection. Our host was very friendly and helpful..The location of the apartment is great for a stay in Skiathos.. The hotel staff are very kind, helpfull and nice. The pool bar was amazing, very organised, clean and beautifull view. Buffet for breakfast was also delicious.